Inseparable - Description | W. W. Norton & Company Ltd. 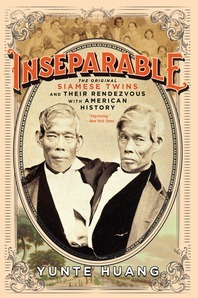 Twins Chang and Eng Bunker (1811-1874), conjoined at the sternum by a band of cartilage and a fused liver, were “discovered” in Siam by a British merchant in 1824. Yunte Huang depicts the twins, arriving in Boston in 1829, first as museum exhibits but later as financially savvy showmen. Their rise from freak-show celebrities to rich southern gentry; their marriage to two white sisters, resulting in twenty-one children; and their owning of slaves is here not just another sensational biography but an excavation of America’s historical penchant for finding feast in the abnormal, for tyrannizing the “other”—a tradition that, as Huang reveals, becomes inseparable from American history itself.